One of the best things about a quilting vacation is getting caught up on blocks of the month! I really dialed back the number of BOMs I signed up for this year ('cuz, you know, I have so many from previous years!). One I couldn't resist was "Park Bench" by Julie Herman of Jaybird Quilts. I picked up the kit with the same fabrics Julie used at Quilt Essentials in Laramie, Wyoming -- maybe two years ago? So when Beth announced she would teach this quilt as a BOM at Ruth's Stitchery this year, I was ready! Remarkably enough, I kept up with the monthly assignments. And while watching the first days of the Rio Olympics, I finished the last three blocks! A word of caution: don't try to piece complicated blocks while watching TV. I mis-pieced two of the 15 blocks -- but really, only someone who has already made the quilt using the same Carolyn Friendlander "Botanics" fabrics would notice. Right? Friend Betty designed an alternate layout. So as soon as I get a photo of her quilt, I'll make the background blocks and get this baby sewn together. I love the fabrics, and Julie's directions are excellent. Really! The mistakes are entirely due to me watching the TV instead of the pattern! Two quilts bound today -- photos to follow on Friday! 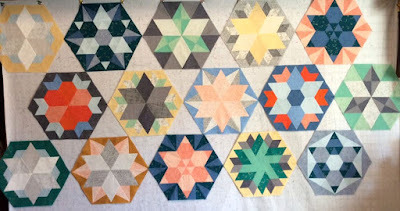 I was very interested to see these blocks Marti, as I have a similar project which I was making in EPP method. I got distracted and put them away, but I know they're there and waiting! so I am keen to see the layout Betty has in mind. I have been avoiding Blocks of the Month type projects because I don't think I could stay "current" with all the projects I have looming in various stages of completion. Binding 2 quilts in a day is a big task. I just finished a double bed size (80x90); with Susie's Magic Binding. I prepped the binding 2 weeks ago, so this afternoon, I had to trim and bind. It is my favorite method, but I don't think I could do two in a day. I started at 3 pm or so, and finished up at 7:30! My biggest slowdown is "joining the ends" so that the piping lines up nicely. I will have a post on my blog later tonight. www.stitchinggrandma.wordpress.com FYI - will link back to your great tutorial!